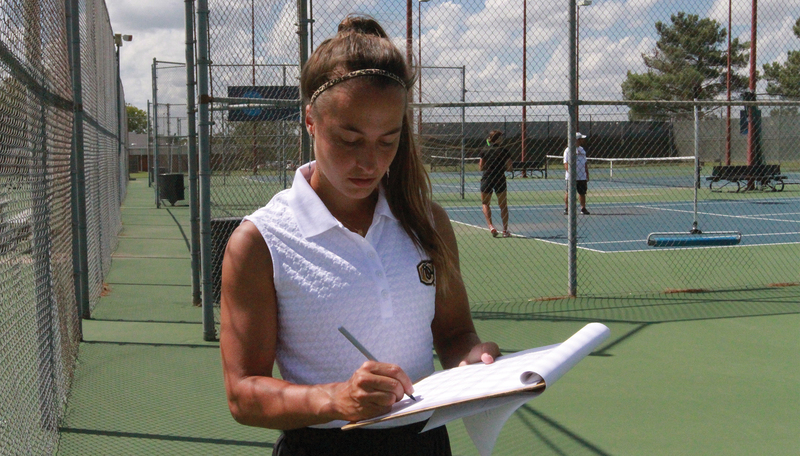 For the Cameron University Women’s Tennis team, tennis is a game of mind over matter. Women’s tennis player Jordan Clauson was down six to one in her match at the Midwestern State Invitational in Wichita Falls, Texas. “My mind was gone,” Clauson said. It wasn’t until Graduate Assistant Coach of Women’s Tennis Eva Castiglioni told Clauson to change her mindset that things finally clicked for her. Castiglioni knows the importance of mindset in tennis. That’s why in the coming season the women’s tennis team is focusing on more than just physical technique. During practice Castiglioni is making a point to emphasize mental toughness on the court. She knows that during a match the pressure can difficult to deal with, and that inability to adjust can lead a player to crack. Though Castiglioni recognizes the importance of practice, she believes that a winning mindset starts off the court. That’s why she attempts build strong relationships with her players outside of practice. She wants them to be able to come to her with any problem that they have, so that she can help them fix it. Castiglioni wants her players to be comfortable enough with her to remain open and honest. According to Castiglioni, those bonds affect performance on the court. Head Tennis Coach Josh Cobble also plays a key role in helping his players focus their mindsets on and off the court. For Clauson, as a player, the effort that her coaches put into supporting her makes a big difference. Clauson said it’s not only her relationship with her coaches that matters, but also her relationships with her teammates. Her network of teammates offers her friendship and a support system, but most importantly, they hold her accountable. Women’s tennis player Zhenia Shviadok also understands the importance of mindset, but for her keeping centered is more of an internal process. Even though it can be difficult, she attempts to put everything but tennis out of her head when she steps onto the court. Shviadok finds the the process stress-reliving. For women’s tennis player Sara Petric, being in the proper state of mind is more about adaptation than anything else. She knows factors that affect her game vary from day to day. Petric feels that fluidity on the court is the key to a successful match. Player Rebeka Velasova stays focused on the court by giving and receiving good energy. Velasova feels that energy is what binds her to her coaches and teammates and what gives her extra drive during a match. Velasova can feel this energy best when she’s on the court and her teammates are cheering for her. She loves the feeling of walking off the court knowing that her teammates are happy for her and proud of her. Clauson also believes that energy is an integral part of staying on top of her game. It helps her stay in the right state of mind. But for her, energy is more of an abstract concept, something that she feels rather than something concrete. Shviadok, on the other hand, gets her energy from a mutual sense of trust between her and her teammates. For her, it’s not about cheering or positivity, it’s about a shared understanding that everyone is going to do their best as individuals. No matter how players find their center, Castiglioni knows that it’s important for them to find it. 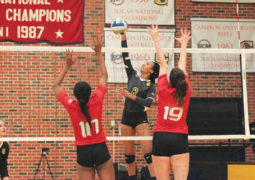 She understands that players can’t be at one hundred percent every day, so she attempts to cultivate an environment where she can adapt to their needs. Even on days when players aren’t fully there, she hopes that they can each find that energy, focus and mental clarity for themselves. That way, they can bring their best game in each match. For both players and coaches, the important thing is not how they find their focus and mental clarity on the court, but that they’re able to find it. Because for the Cameron University Women’s tennis team, tennis is a game of mind over matter.